Cascade Pathways began in 2001 and has been offering substance abuse and addiction treatment to individuals and families in Benton, Linn, Lincoln and Lane counties since that time. 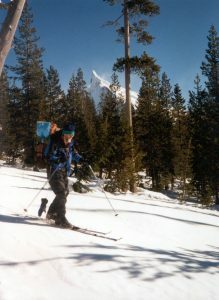 The program is currently an office-based outpatient treatment program, but which at times has been able to provide some unique wilderness and nature-based experiential therapy modalities. The program director and therapist, Hal Darst, CADC II, has been working with adults, families and adolescents in various therapeutic settings since 1980. Following graduate school at the University of Oregon he had the unique opportunity to work for Beech Hill / Outward Bound, where he was cross-trained as an addictions counselor and wilderness guide to provide drug and alcohol counseling to adolescents in a wilderness setting – such as hiking the Appalachian Trail or canoeing on the many New England lakes and rivers. It was the first program in the nation recognized to provide a uniquely powerful blend of therapy with nature and he served as therapist, guide and program director. In the years following he has worked with other prominent residential youth wilderness therapy programs including the Aspen Achievement Academy, the Catherine Freer Wilderness Therapy Program and Ravens Way (for Native Alaskan youth) in Sitka, Alaska, as well as with traditional outdoor education programs such as Hurricane Island Outward Bound and the Athenian Wilderness Experience. He has also worked as an outpatient therapist with LookingGlass Adolescent Recovery program and the Confederated Tribes of Siletz Indians outpatient alcohol and drug treatment program. Douglas Bovee, MD., provides consulting services as Medical Director for Cascade Pathways. Dr. Douglas Bovee was born in Lansing, MI, and graduated from the University Of Miami School Of Medicine in 1978 after attending pharmacy school at the University of Florida. He completed his internship at the Public Health Service Hospital in San Francisco, and then a residency in internal medicine at the University of New Mexico-Albuquerque. He received fellowships from both the American College of Physicians and the American Society of Addiction Medicine. After working in an internal med clinic and a hospital-based addiction treatment program in Seattle, he has lived in Eugene for nearly 20 years, the last decade in primary care, and is the President of the board of Lane Independent Primary Physicians. Formerly a full time Addiction Medicine physician for Serenity Lane, Dr. Bovee has continued his work in methadone clinics, and acted as Medical Director at both Integrated Health Clinic of Eugene and Prevention and Recovery Northwest. He continues his commitment to Internal and Addiction medicine in his current practice at South Hilyard Clinic. Kevin Riley, LCSW, CADC III is providing Clinical Supervision for Cascade Pathways. He currently has his own private practice providing mental health treatment services. In the past he has also worked for the Catherine Freer Wilderness Therapy Expeditions in the capacity of both Clinical Supervisor and therapist. Cascade Pathways is a member of the Evergreen Behavioral Health Association, a coalition of therapists in Benton, Linn and Lincoln counties.